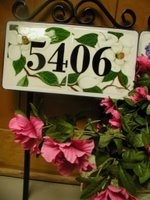 Please allow four to six weeks for all personalized orders. Extra charge for rush orders. Orders can be placed by email, telephone. Black cedar frame, ready to hang, finished size is 14"x8". 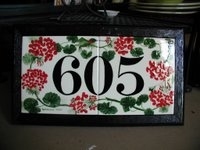 same as "605" with in-the-ground mount, 18" legs, finished size is "14x28". Black cedar frame with -in-the-ground mount, finished size is 22"x28". Black metal frame, powder coated, ready to hang, finished size is 13"x10". Black metal frame, powder coated, ready to hang, finished size is 19"x10". as above with in ground mount. 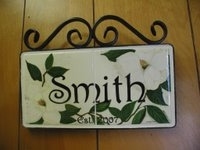 Oval ceramic tile, attaches with screws, 6.5" x 8.5"
Specify last name. First names and est. year are optional. Oval ceramic tile, attaches with screws, 8"x10"
Other designs available upon request, art charge may apply.